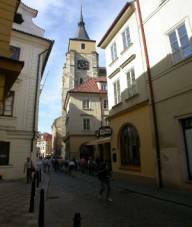 Roots of St.Giles church, are dated until year 1271. Next big rebuilding was made in year 1339 and 1731. Dominicans are here since year 1626. There exists world-known fresco paintings by V.V.Reiner (1734). 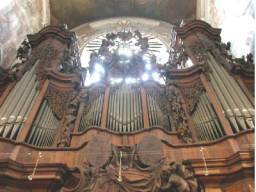 Organ dates since year 1733, including precious baroque wood-carving. 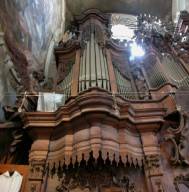 In year 1888, organ was romantic rebuild by Emanuel Stephan Petr. Next adjustment of organ was made in year 1969 (Organa) by prof.J.B.Krajs. 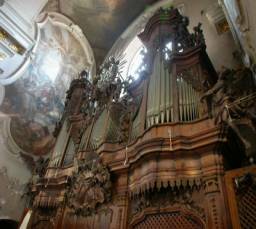 This instrument is favourite concert organ for notable czech's and europe's organists. For example, Eduard Tregler (1868-1932), composer and organ virtuos, was organist at this church. Current state is not good and so there is absolute necessary to start with rebuilding and saving of this beautiful instrument. It was great pity, when this organ quietened. 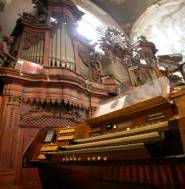 Praparation of general reconstruction of organ at St.Gilles was started in the year 2004/2005. There exist special bank account, which is created only for correction-reconstruction of this beautiful organ. Rebuilding will be started during the year 2005/2006 and will be continued in other etaps. Rebuilding contens new play table, electric cabels, air-pipes, cleaning and intonations of whole instrument. Rebuilding contens also register transmition and building air-pipes for 4-th manual and noise-down table for motor. The prise we suppose 2.000 000, czech crowns (80.000 euro). This service will be made by organ company ELTRACT Fischer (Petr Fischer). 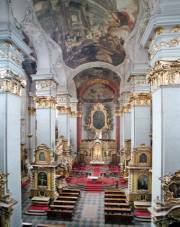 We also like rebuilt organ in Cappel. If You need, we make tax certificate. WE BESEECH FOR FINANCE HELP FOR THIS REBUILDING.